What equipment is needed to complete P90X3? The Equipment for P90X3 varies from person to person based on his/her choice, however few of them are strongly recommended by Tony Horton to use for better results. 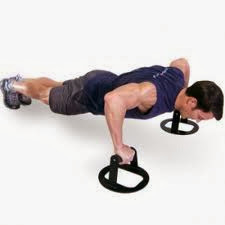 Equipment for P90X3 are similar to what recommended for P90X. Weights or resistance bands and a chin-up bar(or a way to do chin-ups and pull-ups) are highly recommended. resistance bands of around 25 to 30 pounds would be enough to gain better results. Additionally, the Chin-Up Max, Jump Mat, Tony Horton Power Stands (or other push up stands), Yoga Block and the P90X App are all recommended as well. For the base, you may not need any equipment. You can complete the program with out equipment as well. In the same way how we could do P90X base level with out equipment, in the similar way the P90X3 base program too can be completed with out equipment. However, to elite workouts one need bands. Does P90X3 comes with any equipment? #The basic DVD kit will not include any equipment. #Ultimate Kit will include 3 Pro-grade resistance bands, Premium Beach body® Jump Mat, Gym-Quality P90X Chin-Up Bar, P90X Chin-Up Max.